Grocery shopping is something that you pretty much always have to stay on top of, especially with a family of four. We are fortunate in our family because Lyndsey is a good shopper and we consume nearly 100% of the perishable foods that we purchase, including fruits and vegetables. We have one option for picking up supplies in Mal Pais and that is at the Super Chico. The place is pretty small compared to the grocery stores in Santa Teresa so it is a little limiting. I also think they get most of their deliveries once a week so the produce and other selections can be a little weak at times. One good thing about Super Chico is that it only abut a 5 minute walk from the house. It is also on the way to one of the beaches so we can pick up some juice or ice cream for Eli if we feel like it. Shopping is always a little bit of a chore in Santa Teresa, especially in the busy season. The roads are insanely dusty this time of year during the summer months so the traffic with the tourists and locals makes that part of town kind of a drag to go to. Most of the people wear dust masks or bandanas over their face to limit the dust and the negative side effects it could have including eye infections and respiratory issues. 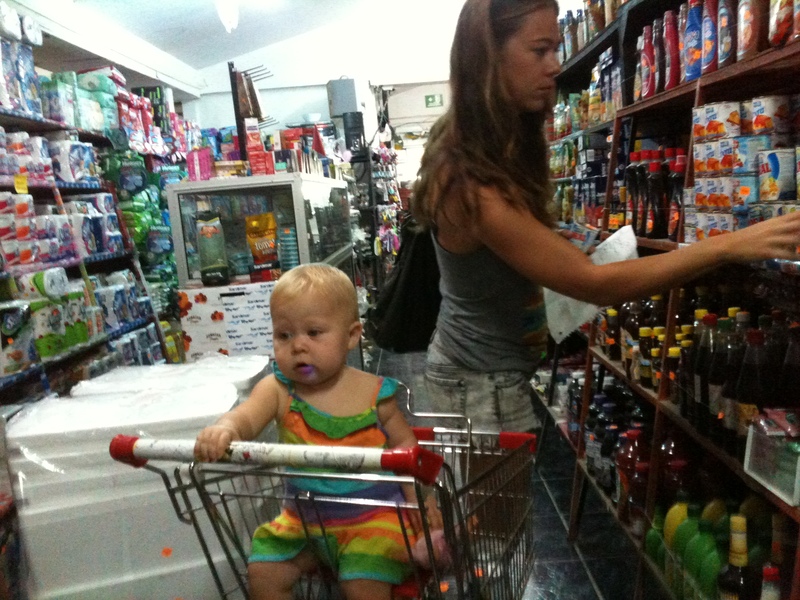 There is however a selection of grocery stores to choose from in comparison to Mal Pais. Compared to Cobano or where we use to live In Atenas, shopping is still pretty limiting, but if you try hard enough you may find just about everything you need is Santa Teresa… as long as you are flexible and willing to pay for it. There are not any of the major chains that you normally see around Costa Rica like Pali, Maxi or Mega Mart , there is however Super Ronny 1 and Super Ronny 2. Super Fresca, Super Costa, Super Maya, Super Hacienda and a handful of others. We generally only go to Super Ronny 1 or Super Costa. Super Ronny 1 is the closest to us in Santa Teresa, they also are the only store with fresh meat and whole organic chickens. Every where else that I am aware of has their meat frozen. We go to Super Costa when we need to purchase more minutes for our cell phone, or if we need to pay bills. The prices are right in line with the Super Ronnys but not as economical as Super Fresca. Rumor has it they are the cheapest in town, however we didn’t think so with what we purchase. Super Fresca supposedly also has the freshest vegetables. We haven’t really shopped at Super Maya, their stock is pretty limited in comparison. Super Hacienda is the most expensive. 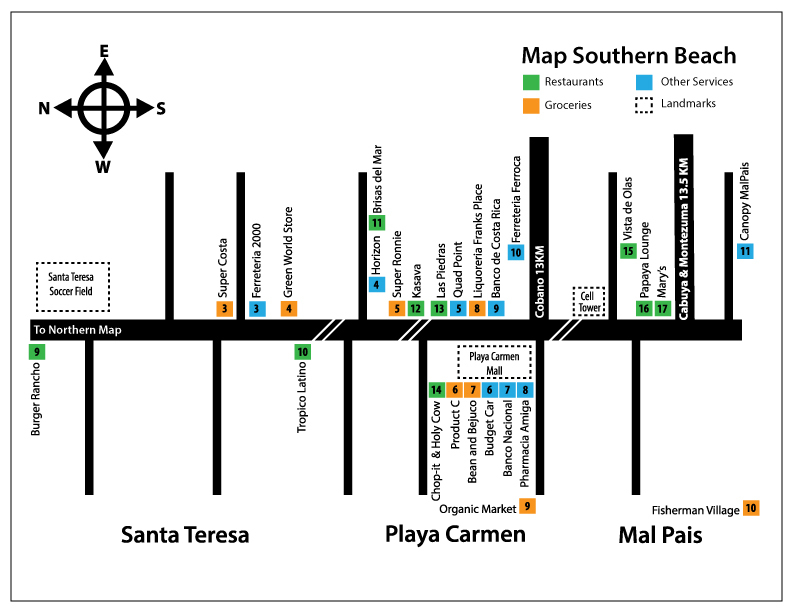 Super Hacienda is also the furthest away but the closest to Playa Hermosa so they get a lot of the Playa Hermosa traffic. Wide variety of all ethnic foods, a large selection of organic ingredients and a counter in the back with fresh meats. Playa Carmen Mall. (+506) 8730-3627. Open 9:00am-7:00pm. A specialty store offering a variety of all natural & organic products difficult to find in the area. Playa Carmen (across from Playa Carmen Mall). Open 9:00am-9:00pm. Santa Teresa (+506) 2640-0450. Open Mon-Fri 7:00am-1:00pm. Closed Sun. Playa Carmen (+506) 8385-8300. Open Mon-Fri 7:00am-12:00pm, 1:00pm-4:00pm and Sat 7:00am-12:00pm. Closed Sun. Cobano (+506) 2642-0043. Open Mon-Fri 7:00am-5:00pm and Sat 7:00am-2:00pm. Closed Sun.